Current limitations of available antidepressants include delays in therapeutic effects from several weeks to months and low remission rates.8,9 Revolutionizing the therapeutic options for TRD, ketamine (or RS-(±)-ketamine), an N-methyl-d-aspartate (NMDA) receptor antagonist, administered at subanesthetic doses can elicit robust, rapid, and sustained antidepressant effects in TRD.10 The majority of clinical trials that describe rapid antidepressant effects on TRD involve the RS-(±)-ketamine.11–15 A recently published trial performed by Singh et al17 reported the rapid antidepressant action of esketamine (S-(+)-ketamine) after a 40-minute intravenous (IV) infusion of either 0.20 mg/kg or 0.40 mg/kg dose in patients with TRD. It was also demonstrated that a lower dose produced a better tolerability while maintaining efficacy. Recently, esketamine was referred to as a less dissociative drug than RS-(±)-ketamine.12 However, this comparison has been insufficiently studied since there are only a few publications regarding esketamine use on TRD and with limited diversity of posology.16,17 Consequently, there is little evidence about the safety and tolerability profile of esketamine and its dissociative properties when used in TRD patients. Most protocols for ketamine administration adopt a timeframe of 40 minutes for infusion. However, this parameter is not supported by evidence, considering that in anesthesiology it is common to use a higher dose of RS-(±)-ketamine (>2 mg/kg) with faster speed of infusion lasting 5–10 minutes for IV administration, and this is particularly true regarding esketamine.18,19 We examined the efficacy, safety, and tolerability of off-label IV use of esketamine in TRD. This retrospective chart review was carried out at the inpatient unit at the Psychiatry Service at the University Hospital – Universidade Federal da Bahia, Salvador, Brazil. Patients were assessed between June 2012 and December 2015, with the diagnosis of MDD and dipolar disorder being based upon Diagnostic and Statistical Manual of Mental Disorders, Fourth Edition, Text Revision criteria (Diagnostic and Statistical Manual of Mental Disorders, Fourth Edition, Text Revision [DSM-IV-TR], 2000); Montgomery–Åsberg Depression Rating Scale (MADRS)20 was administered to measure depressive symptom severity before infusion and at 24 hours, 72 hours, and 7 days after infusion of ketamine, and the Clinical Global Impression scale (CGI) was administered21 before and at 7 days after infusion. TRD was defined as failure to respond to 2 or more trials using antidepressant therapy in adequate doses, with durations of at least 6 weeks each. All the participants were undergoing naturalistic treatment for depression and comorbidities, according to clinical demand. The clinical protocol excluded the use of esketamine in patients if they met any of the following criteria: psychotic disorder, previous dissociative disorders, comorbid dementia, substance use disorders, and/or uncontrolled hypertension. The primary endpoints were remission of depressive symptoms and therapeutic response, defined as at least 50% improvement from baseline depression score. All adverse effects that emerged during infusion and at subsequent observation periods were also registered. All subjects were treated with esketamine (Ketamin® Dextrocetamine hydrochloride Injectable Solution 50 mg/mL. Cristalia Produtos Químicos Farmarcêuticos Ltda, Itapira, Brazil) at a standard dose of 0.25 mg/kg administered IV for a duration of 10 minutes. The study was approved by the local Institutional Review Board (Complex University Hospital Professor Edgard Santos – Federal University of Bahia – Number: 43645915.1.10000.0049). The Research Ethics Committee – University Hospital Prof Edgard Santos (Local Institutional Review Board) waived the need for patient consent for this retrospective review since all data were anonymized and kept confidential. A summary of statistical parameters (mean, standard deviation, median, interquartile range, minimum, and maximum) are reported for the MADRS score at each point in time. Quantitative temporal differences among time points were tested, controlling for clinical comorbidities, through a linear mixed effects model. The model was fit with one fixed intercept, Time and Presence of Clinical Comorbidity as fixed effect, and one random intercept for every patient, allowing for the analysis of data without data imputation or patient exclusion from the sample.22 Assumptions of normality of the residuals and homogeneity of variance were verified through QQ Plot and graphical analysis of predicted values and residuals. Mean differences were estimated from the model through Tukey contrasts. Absolute and relative (percentage) frequencies of remission of depressive symptoms and therapeutic response are reported. All relative frequencies (percentage) are related to the initial number of patients included. MADRS scores among these groups are also reported. All analyses were conducted in R Environment and Programming Language (version 3.3.1); mixed effects model was fit using lme4 (version 1.1.12) package with restricted maximum likelihood method (REML). Sociodemographic characteristics are displayed in Table 1. Abbreviations: OCD, obsessive compulsive disorder; PTSD, posttraumatic stress disorder; GAD, generalized anxiety disorder; ADHD, attention-deficit hyperactivity disorder. Initially, our sample consisted of 30 patients, but MADRS data was not available for 3 of them, hence 27 were finally included. Therefore a retrospective chart review is reported for 23 patients with TRD and 4 with bipolar depression, who all received a low-dose of esketamine administered very quickly: time duration 10 minutes. The majority of participants had chronic depressive symptoms, and all of them had presented at least 2 failed trials using antidepressants. The patients presented a high MADRS mean score (36.2±7.6) prior to intervention. The median of onset age of major depressive episode was 38 years, with half of the patients ranging from 26.0 to 50.0 years. All patients presented a lifetime history of major depressive episode with an average of 4.0 episodes (interquartile range: 2.8–6.0). Four patients (14.8%) were bipolar. 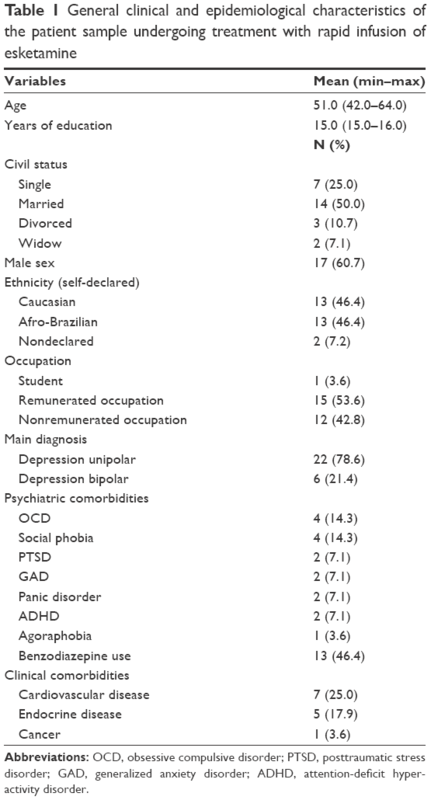 The most common psychiatric comorbidities were obsessive compulsive disorder (11.1%) and social phobia (11.1%). All patients from this study were treated with antidepressants, 20 (74.1%) used atypical antipsychotics, and only 5 (18.5%) used lithium (the others had prior therapeutic failure with this drug and/or had contraindications to using it). Benzodiazepine usage was present in 13 patients (48.1%). Most subjects (17 individuals; 63.0% of the sample) did not have medical comorbidities. Among those who presented medical comorbidities, cardiovascular diseases were the most common (33.3%), followed by endocrine diseases (18.5%) and cancer (7.4%). Average values of MADRS showed reductions during follow-up time. A summary of the statistics is displayed in Table 2 and Figure 1. Note: Number differences are due to losses in follow-up. Abbreviations: CGI, Clinical Global Impression; MADRS, Montgomery–Åsberg Depression Rating Scale; IQR, interquartile range. Figure 1 Temporal evolution of therapeutic remission of the patient sample upon rapid infusion esketamine treatment. Note: Points represent means, and error bars show 95% confidence intervals estimated from standard errors. Abbreviation: MADRS, Montgomery–Åsberg Depression Rating Scale. 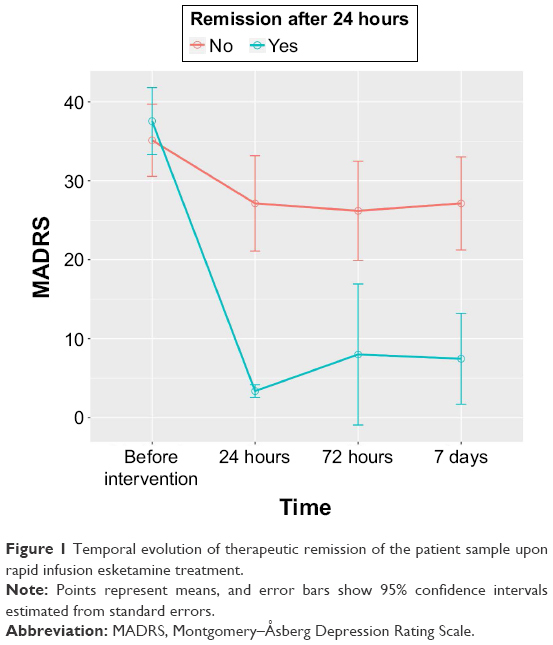 Thirteen patients (48.1%) displayed therapeutic response (MADRS score reduction ≥50%) within 1 week (7 days) after intervention. Remission (MADRS <7) was observed in 10 patients (37.0%) in the same time period. Therapeutic response and remission frequencies were observed in 16 patients (59.3%) and 11 patients (40.7%), respectively, within 24 hours after drug infusion. The mixed effects model converged to a unique solution (REML criterion =716.04; random effect SD =10.636; fixed intercept =34.473). Fixed-effect estimate for the presence of medical comorbidity was positive (estimate =3.397; standard error =4.929), although not significant (Type II Wald χ2=0.475; df=1; P=0.491). Time factor was significant (Type II Wald χ2=66.846; df=3; P<0.001), with large estimated mean differences between the time points Before Intervention and the remaining follow-up points (24 hours – BI: −18.73±2.31; 72 hours – BI: −17.51±2.34; 7 days – BI: −17.16±2.34; all P-values <0.001). Vital signs, electrocardiograms, and clinical laboratory assessments were within normal ranges. No deaths occurred in the cases reviewed. No clinically significant changes in laboratory tests, electrocardiograms, or physical examinations were observed in the week following esketamine infusion. The most relevant side effect observed was mild to severe dissociative symptoms. Three patients (11.1%) had psychomimetic effects during esketamine infusion, which presented as severe dissociative symptoms, and two of these cases showed remission within 3 weeks after esketamine administration. Previous clinical trials described the rapid action of NMDA antagonist ketamine after a single infusion in patients with TRD11,15,23,24 as well as the variable duration of antidepressant effects ranging from 1 to several weeks.15,25 Although it represents a major advance in the treatment of TRD, many questions remain about the efficacy and tolerability of this drug in depressed patients. To our knowledge, this is the first report regarding rapid infusion time (10 minutes) of esketamine in TRD patients. The present results suggest that, despite the robust efficacy obtained in these naturalistically treated patients, this rate of drug administration produced certain severe dissociative side effects. These results were not modified by the presence of medical and psychiatric comorbidities. The finding that esketamine use may be associated with highly distressing symptoms related to the dissociative experience challenges previous studies that characterize the esketamine as more tolerable than the RS-(±)-ketamine.26 In four patients, the severity of side effects seemed to contradict the improvement of depressive symptoms. The present findings should be interpreted with caution since several limitations inherent to using a retrospective design are present. They include the lack of a control group and lack of randomization. As this was not a controlled study and the subjects had taken several other medications that might modify antidepressant effects and pharmacokinetics of esketamine, we cannot assure whether the efficacy is related to esketamine use alone or is a result of combined effects of esketamine and concomitant medications. Additionally, no standardized clinical measures were used to evaluate psychomimetic adverse effects. Nevertheless, due to these limitations, a prospective, controlled study using different doses and time of infusion is strongly required to confirm the efficacy of the esketamine as a feasible option for eliciting fast-acting antidepressant effects, with a reasonable side effect profile. The present case series suggests that rapid infusion of esketamine has similar efficacy when compared with RS-(±)-ketamine data in the literature. On the other hand, esketamine seems to have poor tolerability when compared to the racemic formulation. However, the infusion rate used in the present study may explain, at least in part, this poor tolerability. Randomized, controlled studies comparing efficacy and tolerability of S-(+)- and RS-(±)-ketamine are needed to confirm the present findings. Fava M, Davidson KG. Definition and epidemiology of treatment-resistant depression. Psychiatr Clin North Am. 1996;19(2):179–200. Gaynes BN, Warden D, Trivedi MH, Wisniewski SR, Fava M, Rush AJ. What did STAR*D teach us? Results from a large-scale, practical, clinical trial for patients with depression. Psychiatr Serv. 2009;60(11):1439–1445. Fervaha G, Foussias G, Takeuchi H, Agid O, Remington G. Motivational deficits in major depressive disorder: cross-sectional and longitudinal relationships with functional impairment and subjective well-being. Compr Psychiatry. 2016;(66):31–38. Gu CZ, He HL, Duan HF, Su ZH, Chen H, Gan JL. Predictors of neurocognitive impairment at 2 years after a first-episode major depressive disorder. Compr Psychiatry. 2016;(68):24–33. Kubitz N, Mehra M, Potluri RC, Garg N, Cossrow N. Characterization of treatment resistant depression episodes in a cohort of patients from a US commercial claims database. PloS One. 2013;8(10):e76882. Frazer A, Benmansour S. Delayed pharmacological effects of antidepressants. Mol Psychiatry. 2002;7(Suppl 1):S23–S28. Galvez V, Nikolin S, Ho KA, Alonzo A, Somogyi AA, Loo CK. Increase in PAS-induced neuroplasticity after a treatment course of intranasal ketamine for depression. Report of three cases from a placebo-controlled trial. Compr Psychiatry. 2017;73:31–34. Berman RM, Cappiello A, Anand A, et al. Antidepressant effects of ketamine in depressed patients. Biol Psychiatry. 2000;47(4):351–354. Paul R, Schaaff N, Padberg F, Moller HJ, Frodl T. Comparison of racemic ketamine and S-ketamine in treatment-resistant major depression: report of two cases. World J Biol Psychiatry. 2009;10(3):241–244. Fond G, Loundou A, Rabu C, et al. Ketamine administration in depressive disorders: a systematic review and meta-analysis. Psychopharmacology. 2014;231(18):3663–3676. McGirr A, Berlim MT, Bond DJ, Fleck MP, Yatham LN, Lam RW. A systematic review and meta-analysis of randomized, double-blind, placebo-controlled trials of ketamine in the rapid treatment of major depressive episodes. Psychol Med. 2015;45(4):693–704. Zarate CA Jr, Singh JB, Carlson PJ, et al. A randomized trial of an N-methyl-D-aspartate antagonist in treatment-resistant major depression. Archiv Gen Psychiatry. 2006;63(8):856–864. Pfenninger EG, Durieux ME, Himmelseher S. Cognitive impairment after small-dose ketamine isomers in comparison to equianalgesic racemic ketamine in human volunteers. Anesthesiology. 2002;96(2):357–366. Singh JB, Fedgchin M, Daly E, et al. Intravenous esketamine in adult treatment-resistant depression: a double-blind, double-randomization, placebo-controlled study. Biol Psychiatry. 2016;80(6):424–431. Green SM, Rothrock SG, Lynch EL, et al. Intramuscular ketamine for pediatric sedation in the emergency department: safety profile in 1,022 cases. Ann Emerg Med. 1998;31(6):688–697. Sinner B, Graf BM. Ketamine. In: Urban BW SJ, Schwilden H, editors. Handbook Experimental Pharmacology. Berlin, Germany: Springer; 2008:313–333. Montgomery SA, Asberg M. A new depression scale designed to be sensitive to change. Br J Psychiatry. 1979;134(4):382–389. W G. Clinical Impressions Scale (CGI). In: Rush AJ, Pincus HA, First MB, et al, editors. Handbook of Psychiatric Measures. Washington, DC: American Psychiatric Association; 2000:100–102. Littell RC, Pendergast J, Natarajan R. Modelling covariance structure in the analysis of repeated measures data. Stat Med. 2000;19(13):1793–1819. Diazgranados N, Ibrahim L, Brutsche NE, et al. A randomized add-on trial of an N-methyl-D-aspartate antagonist in treatment-resistant bipolar depression. Archiv Gen Psychiatry. 2010;67(8):793–802. DiazGranados N, Ibrahim LA, Brutsche NE, et al. Rapid resolution of suicidal ideation after a single infusion of an N-methyl-D-aspartate antagonist in patients with treatment-resistant major depressive disorder. J Clin Psychiatry. 2010;71(12):1605–1611. Zarate C, Machado-Vieira R, Henter I, Ibrahim L, Diazgranados N, Salvadore G. Glutamatergic modulators: the future of treating mood disorders? Harvard Rev Psychiatry. 2010;18(5):293–303. Mathew SJ, Shah A, Lapidus K, et al. Ketamine for treatment-resistant unipolar depression. CNS Drugs. 2012;26(3):189–204. Luckenbaugh DA, Niciu MJ, Ionescu DF, et al. Do the dissociative side effects of ketamine mediate its antidepressant effects? J Affect Disorders. 2014;(159):56–61.